Ficus bonsai trees were my first choice when I started falling in love with bonsai hobby. As I find out later on, ficus bonsai is one of the most popular and favorite bonsai trees and makes an excellent first trees for beginners. Looking like a miniature version of the tropical Banyan tree, the ficus is really exotic and rewarding. The Ficus genus (or Fig) is a large and diverse family of plants, which consists of hundreds of different species of evergreen trees, shrubs and woody climbers. They are native mainly to tropical and sub-tropical areas of the world like southern Asia and India and usually found in moist forests in tropical and sub-tropical areas. Among those plants, there are at least a dozen species and hundreds of varieties that are suitable for bonsai cultivation. Nearly any ficus with relatively small leaves can be used for bonsai. 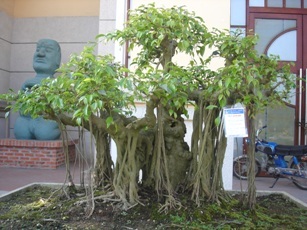 In my country Vietnam, with tropical climate, various types of ficus bonsai trees grow well. The most popular varieties for bonsai passion are: si (Ficus stricta), sanh (Ficus benjamina), đa lông (Ficus drupacea), gừa (Ficus microcarpa), sung (Ficus racemosa), bồ đề (Ficus religiosa). I myself am growing at least one tree of each variety for my collection. Among types of bonsai trees, Ficus has a few of very favorable characteristics to become a good bonsai. Beginner friendly - Most ficus bonsai trees grow quickly and possess a large tolerance for most lighting and soil conditions, rendering them great indoor trees. Moreover, ficus bonsai are extremely lenient for those who are new to watering bonsai trees. Beautiful root – Most Ficus species produce aerial roots from the branches and trunks. Some are straight, some curved, others fluted. Most will do the same in containers. The roots are brittle at first, but strengthen and turn into a very strong part of the tree once they reach nutrients. The striking aerial roots of the banyan fig are often featured in root-over-rock, or clasped-to-rock styles. Small leaves – Bonsai leaves vary in size depending on the species. Some types like Ficus stricta and Ficus benjamina have relative small leaves, which are very good for many bonsai styles. 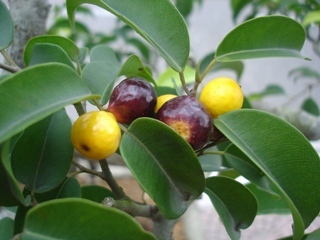 Flowers and Fruits – Ficus trees have flowers, although they are not visible. The "fig" fruits are small and often colorful. They grow on short stems, without stems and in clusters depending upon the species. Ficus trees are very temperamental and can become stressed from simple actions such as being moved from one room to another, so it is essential to choose a healthy specimen from the nursery before taking it home and immersing it in a completely new setting. When choosing a ficus, look for the following characteristics. The tree should have a straight, sturdy trunk free from scars or warping. A ficus should also have rich green leaves with no signs of browning or yellowing, and no rips or tears. The soil should be moist, which indicates a well-watered plant. There should be no bugs in the leaves or soil. There should be no signs of recent leaf loss that would indicate plant stress.